Moto Guzzi, founded in 1921 in the hills of Mandello del Lario, is Italy’s oldest motorcycle manufacturer. Originally famous for horizontal singles such as the 250 cc Airone and 500 cc Falcone, Guzzi in the mid 60s won a government-sponsored competition to supply a larger, more powerful machine to Italian government entities such as the police force. 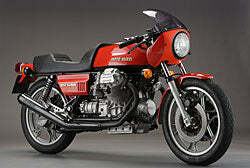 Thus in 1967 was born the original V700 twin, fundamentally the basis of every Moto Guzzi produced since. The V-twin, shaft-drive Guzzi has been made in many variants that stand the test of time. Guzzi has long been the “thinking man’s” Italian motorcycle, due to its stout construction and ease of maintenance. The 750 cc Ambassador and V7 Sport, the 850 cc Eldorado and LeMans, and the 1000 cc Convert and 8-valve Daytona are all models that have vociferous followings. While not as currently successful as Ducati, Moto Guzzi deserves to be. The marque has the longest history and the machines it builds today are the best ever produced by the old factory.